The highest of Mt Crosscut’s four peaks. 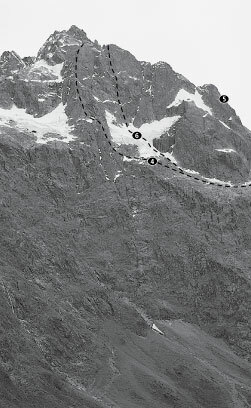 First traverse of all four peaks by Austin Brookes and Archie Simpson in 1964. TN Beckett, Gordon Speden, Hallum Smith, E Rich, Dec 1936. At the head of Cirque Creek climb straight up, climb left, up again, then traverse right and up to the col at the base of East Ridge which is followed to the summit of the East Peak. Bill Gordon, Ralph Miller, Bill Blee, 1955.